The Poston or Colorado River Relocation Center was located in La Paz County, Arizona, 12 miles south of the town of Parker. Poston was named after Charles Debrille Poston, the first Superintendent for Indian Affairs in Arizona. Poston was directly responsible for the establishment, in 1865, of the Colorado River Reservation, where the center is located. La Paz County is a fairly recent political entity; during World War II the Poston area was part of Yuma County. The Colorado River Indian Reservation Tribal Council opposed the use of their land for a relocation center, on the grounds that they did not want to participate in inflicting the same type of injustice as they had suffered. However, the tribe was overruled by the Army and the Bureau of Indian Affairs (BIA). In a verbal agreement the War Relocation Authority (WRA) turned over administration of the center to the BIA. The BIA considered the relocation center an opportunity to develop farm land on the reservation with the benefit of military funds and a large labor pool. The WRA took did not take full control of the center until December 1943. 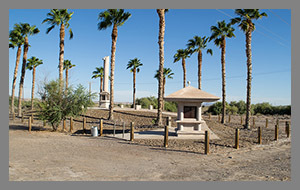 The Poston Memorial Monument (rights) marks the site of the Poston War Relocation Center where 17,867 persons of Japanese ancestry, the majority of whom were United States citizens, were interned during World War II from May 1942 to November 1945. All persons of Japanese descent living on west coast farms, businesses, towns, cities, and states were forcibly evacuated by the United States military on the grounds that they posed a threat to the national security. This massive relocation was authorized by Executive Order 9066, signed by President Franklin D. Roosevelt on February 19, 1942. This Memorial is dedicated to all those men, women and children who suffered countless hardships and indignities at the hands of a nation misguided by wartime hysteria, racial prejudice and fear. May it serve as a constant reminder of our past so that Americans in the future will never again be denied their Constitutional rights and may the remembrance of that experience serve to advance the evolution of the human spirit. Poston actually comprised three separate camps – Poston I, II, and III – which were about three miles apart along what is now Mohave Road. 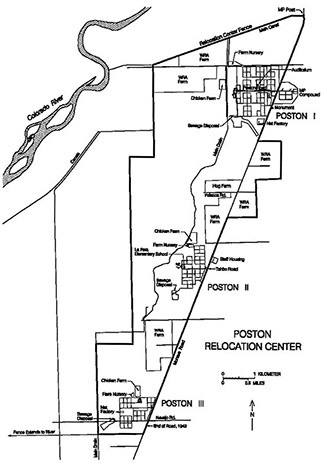 Poston I, the largest of the three camps, was the farthest north. It included administration offices, staff housing areas, warehouses, 36 evacuee residential blocks, a hospital and a military police compound that served the entire camp. Each block contained fourteen barracks, a mess hall, a recreation building, a men's latrine, a women's latrine, laundry facilities, and a fuel oil shed. Recreation halls were used for various purposes, including churches, service organizations, and beauty and barber shops. Several miles south, Poston II had its own administration area, staff housing, garage area, warehouses, and residential blocks. The administration area had ten buildings, including a cold storage building, a medical clinic, a fire station, five office buildings, a storage building, and a post office. A north-south canal ran through the camp, which fed a large swimming pool in its center. There was also a carpentry shop, two houses, eight apartments, and two evacuee-built sheds. Poston III also had an administration area and a garage area as well as 18 evacuee residential blocks. The residential blocks were arranged in three groups of six; one block was used as the elementary school and another for community services. The high school was located in a large open space just below the administrative area. It had an office, library, auditorium and eight classroom buildings, all made of adobe. The camp had a recreation area with two swimming pools and a stage, a motor pool and a dry goods store. Families were assigned space in the wood and tarpaper barracks according to the number of people in their household, usually four families to a building. Housing was primitive and especially hard on the elderly and the ill. Many internees had to carry several buckets of water to their living quarters each day. The lack of privacy was particularly difficult for Japanese women, who were required to sleep, eat, bathe and use the toilet in the company of others. Although the rooms were bare and bleak, the residents did what they could to make themselves comfortable. The evacuees nicknamed them Roasten, Toasten, and Dustin. Construction on Poston I began March 27,1942, with the contractor Del Webb, later of Sun City fame. Del Webb had a large work force already mobilized for military contracts, and built Luke Air Force Base near Phoenix in March 1941. However, the relocation center was Del Webb's biggest challenge up to that time. Webb had a construction job in progress at Blythe, and when he got the contract to build the camps he diverted his crew to Parker. With equipment brought up from Blythe, the initial ground clearing was done in one day. Using 5,000 workers on a double work shift, Poston I was completed in less than three weeks. The pine specified for construction was in short supply, so heart redwood was substituted. When the redwood shrunk much more than expected, millions of feet of thin wood strips had to be ordered to fill the cracks. Because of the heat in Arizona, the standard tarpaper barracks construction was modified so that the buildings had double roofs. A new contract was awarded to Webb to build Poston II and III within 120 days. Guard towers were not constructed at Poston, as they were at the other relocation centers; here they were considered unnecessary because of the isolated location, in the desert at the end of a road.